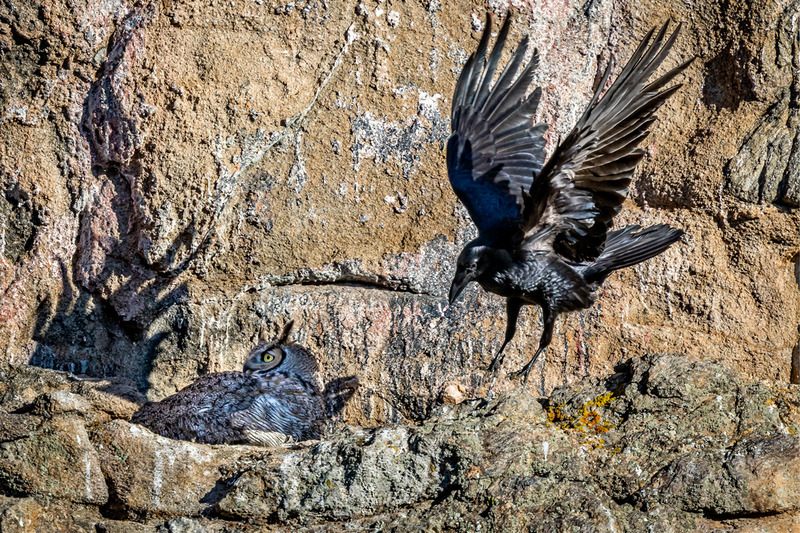 I keep telling myself Great Horned Owls are very capable of dealing with ravens. The male owl is close, but the female is incubating eggs on the ledge nest. She is somewhat restricted in her defensive moves against the two large ravens in attack mode. (cropped to one raven) Hope for the best. Somewhere in Larimer County, CO. Canon EOS 5D Mark IV, Canon EF400mm f/4 DO IS II USM + 1.4xIII. 1/2000s@f/5.6, ISO 400, lens focal length 560mm. 03/11/17 8:03am. Proudly hosted by Sargasso Networks. Current Server Time: 04/24/2019 09:52:05 PM EDT.